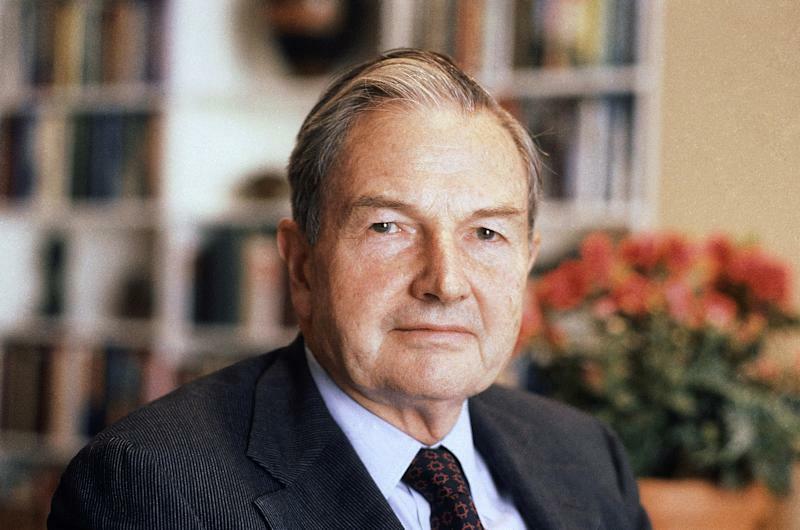 Billionaire Real Estate Mogul David Rockefeller dies at age 101. His San Francisco “Bag Man” James Bronkema is also dead. John Molinari, their Italian “business man” mob-fixer is in his final years. The end of an era of real estate corruption, bribery, elitist black-listing and crony politics on the West Coast. FILE – In this April 31, 1981, file photo, David Rockefeller poses for a photograph. The billionaire philanthropist who was the last of his generation in the famously philanthropic Rockefeller family died, Monday, March 20, 2017, according to a family spokesman. (AP Photo/D. Pickoff, File) NEW YORK (AP) — David Rockefeller, the billionaire businessman and philanthropist who was the last in his generation of one of the country’s most famously philanthropic families, died Monday. He was 101. Rockefeller died in his sleep at his home in Pocantico Hills, New York, according to his spokesman, Fraser P. Seitel. He was the grandson of Standard Oil co-founder John D. Rockefeller and the youngest of six children born to John D. Rockefeller Jr. With the passing of his siblings, he became the guardian of his family’s fortune and head of a sprawling network of family interests, both business and philanthropic, that ranged from environmental conservation to the arts. To mark his 100th birthday in 2015, Rockefeller gave 1,000 acres of land next to a national park to the state of Maine. Aspects of the Rockefeller brothers’ upbringing became famous, including the 25-cent allowance, portions of which had to be set aside for charity and savings, and the inculcation that wealth brings great responsibility. Two of his brothers held elected office: Nelson Rockefeller served as the governor of New York, hungered for the White House and briefly served as vice president. Winthrop Rockefeller was a governor of Arkansas. David Rockefeller, however, wielded power and influence without ever seeking public office. Among his many accomplishments were spurring the project that led to the World Trade Center. And unlike his other brothers, John D. III and Laurance, who shied from the spotlight and were known for philanthropy, David Rockefeller embraced business and traveled and spoke widely as a champion of enlightened capitalism. “American capitalism has brought more benefits to more people than any other system in any part of the world at any time in history,” he said. “The problem is to see that the system is run as efficiently and as honestly as it can be.” Rockefeller graduated from Harvard in 1936 and received a doctorate in economics from the University of Chicago in 1940. He served in the Army during World War II, then began climbing the ranks of management at Chase Bank. That bank merged with The Manhattan Company in 1955 He was named Chase Manhattan’s president in 1961 and chairman and chief executive officer eight years later. He retired in 1981 at age 65 after a 35-year career. In his role of business statesman, Rockefeller preached capitalism at home and favored assisting economies abroad on grounds that bringing prosperity to the Third World would create customers for American products. He parted company with some of his fellow capitalists on income taxes, calling it unseemly to earn $1 million and then find ways to avoid paying taxes on it. He didn’t say how much he paid in taxes and never spoke publicly about his personal worth. In 2015, Forbes magazine estimated his fortune at $3 billion. As one of the Rockefeller grandchildren, David belonged to the last generation in which the inherited family billions were concentrated in a few hands. The next generation, known as “the cousins,” has more people. Rockefeller was estimated to have met more than 200 rulers in more than 100 countries during his lifetime, and often was treated as if he were a visiting head of state. Under Rockefeller, Chase — now JPMorgan Chase & Co. — was the first U.S. bank to open offices in the Soviet Union and China and, in 1974, the first to open an office in Egypt after the Suez crisis of 1956. In his early travels to South Africa, Rockefeller arranged clandestine meetings with several underground black leaders. “I find it terribly important to get overall impressions beyond those I get from businessmen,” he said.But Rockefeller took a lot of heat for his bank’s substantial dealings with South Africa’s white separatist regime and for helping the deposed, terminally ill Shah of Iran come to New York for medical treatment in 1979, the move that triggered the 13-month U.S. embassy hostage crisis in Tehran. Rockefeller maintained the family’s patronage of the arts, including its long-standing relationship with New York’s Museum of Modern Art, of which his mother had been a fervent patron. His private art collection was once valued at $500 million. The Rockefeller estate overlooking the Hudson River north of New York City is the repository of four generations of family history, including Nelson’s art and sculpture collection. One of the major efforts of Rockefeller’s later years was directed at restoring family influence in the landmark Rockefeller Center, most of which had been sold in the 1980s to Japanese investors. He eventually organized an investor group to buy back 45 percent of the property. His philanthropy and other activities earned him a Presidential Medal of Freedom, the nation’s highest civilian honor, in 1998. Rockefeller and his wife, the former Margaret McGrath, married in 1940 and had six children — David Jr., Richard, Abby, Neva, Margaret and Eileen. His wife, an active conservationist, died in 1996. Previous Post WHO ACTUALLY WIRETAPPED TRUMP? GOOGLE DID IT!